At the end of August I turned bullish on uranium price. 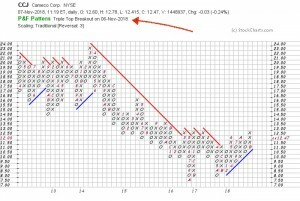 Now just two months later the #uraniumstocks are breaking out led by bellwether $CCJ#Cameco which I just bought on the triple top breakout yesterday. Anthony Milewski CEO of $KBLT.V say there could be a Huge year end rally in #cobalt ??? Look at year end over past 3 years. Glencore's Katanga Mining just got shut down due to radioactive contaminants. This will cause major supply concerns very soon. Cobalt stocks could rally hard into year end. 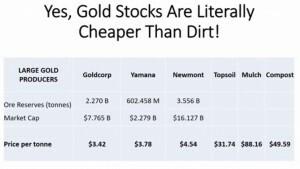 Thanks to Jaime Carrasco for this chart showing how cheap gold stocks have become. They are cheaper than manure! This could be the cheapest time to buy gold ever.